This problem looked really balancy, and nearly everyone fell at least once, often many times. 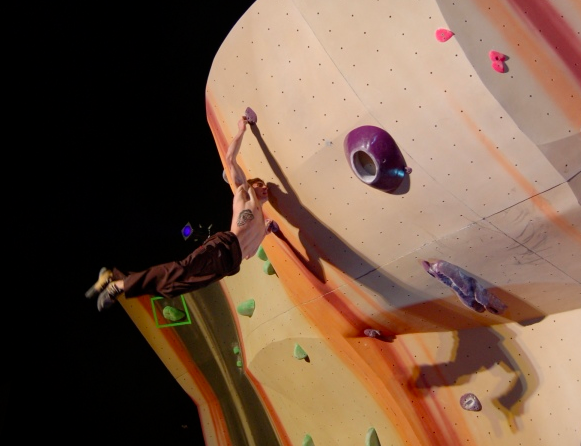 The top looked particularly challenging as it was necessary to press off a low foot and do some hand maneuvering, then get a high right foot and rock up onto it while pulling on the small holds and volume to the finish. 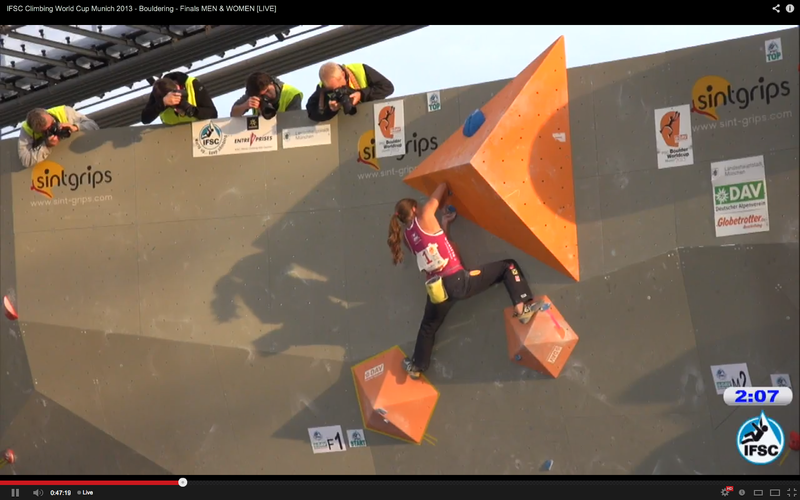 Anna Stöhr trying to figure out the top of WF1. She slipped right after this. After Anna fell off the bottom a few more times she got back up, instead of matching put right on gaston, left into the undercling she’s trying to match on in the pic above, right to volume, grabbed the top! 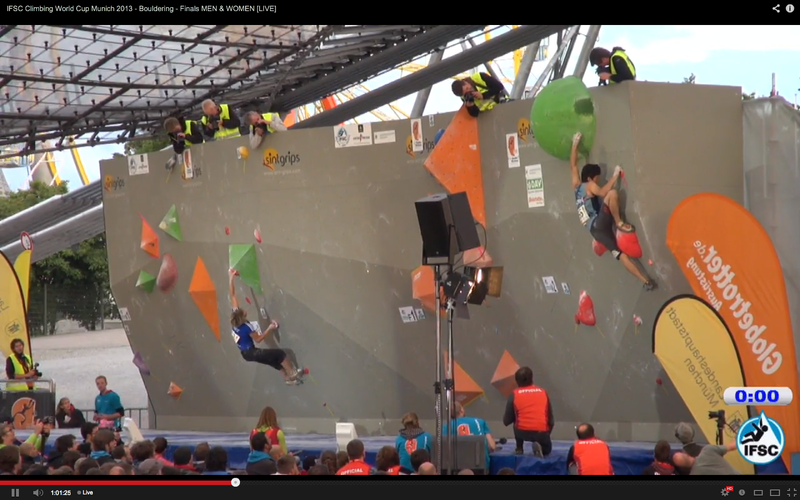 Only the 2nd send of the boulder and it puts her in 2nd as Melanie flashed. Sachi Amma of Japan showing off the only 2 moves of MF1 that anyone did. No one could stick the jump to the red eyebrow out right. Everything just looked too slippery. 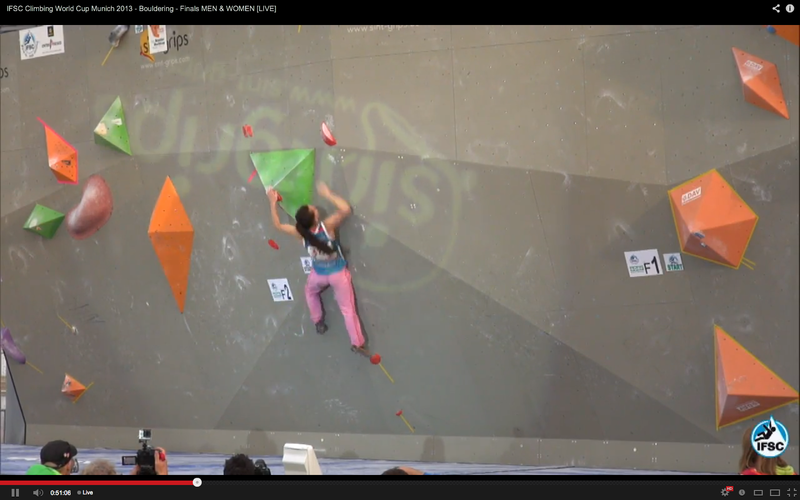 Dinara flashing WF2 with her own method. The announcers said they thought you were supposed to go to the left side of the volume, but the girls jumped straight up one two left and then right to the high right dish. From there left hand flip to catch the swing (Dinara didn’t flip), then squeeze left on the volume/bonus, left again to undercling, high feet, stand up to finish. 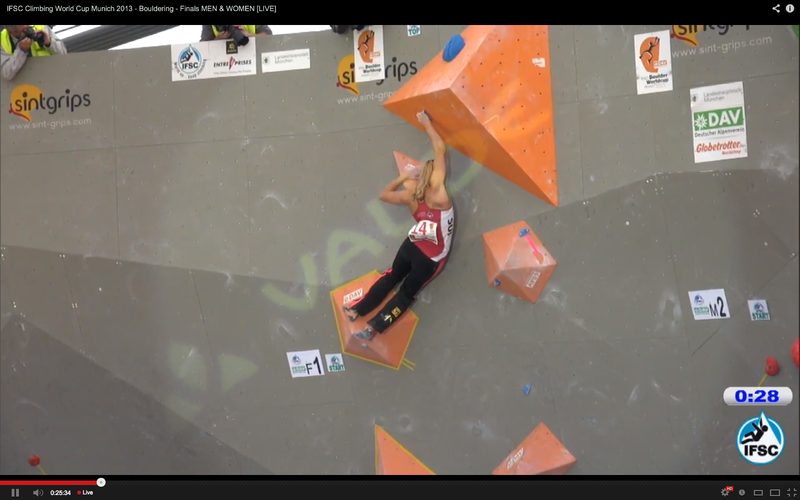 Petra – falling, does sweet jump with left hand flip for the catch, finishes the problem with 2 knees and a heel hook. Petra heel hooking to the top. Melanie – falls, bonus, falls, no send. Keeps falling trying to get left hand to upper left undercling for last move. 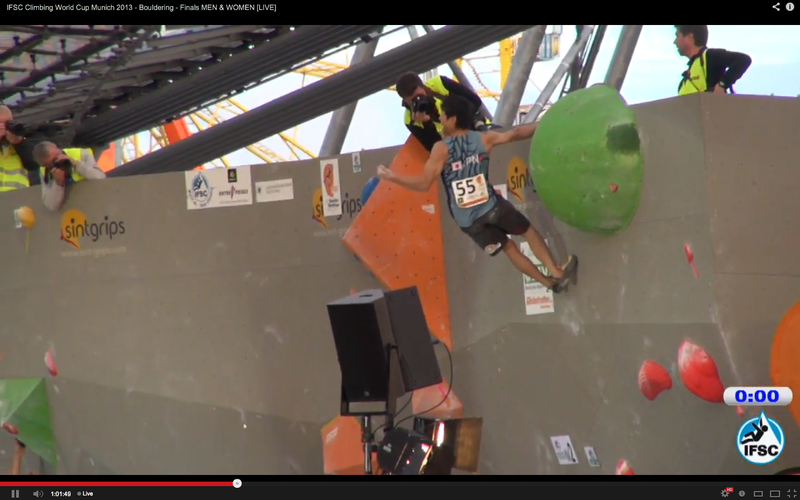 Blobs, arete, press into an volume, move around the volume to the finish. 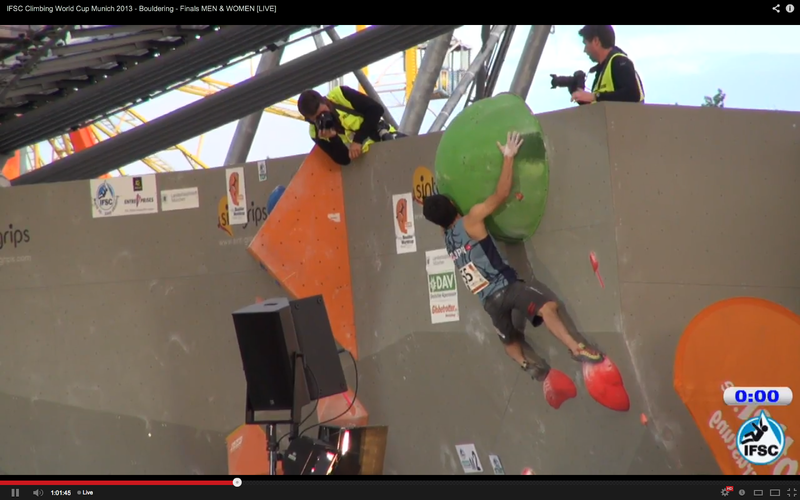 Rei Sugimoto working into the top volume. Rei pressing into the volume. He moved slowly and precisely so he wouldn’t fall. 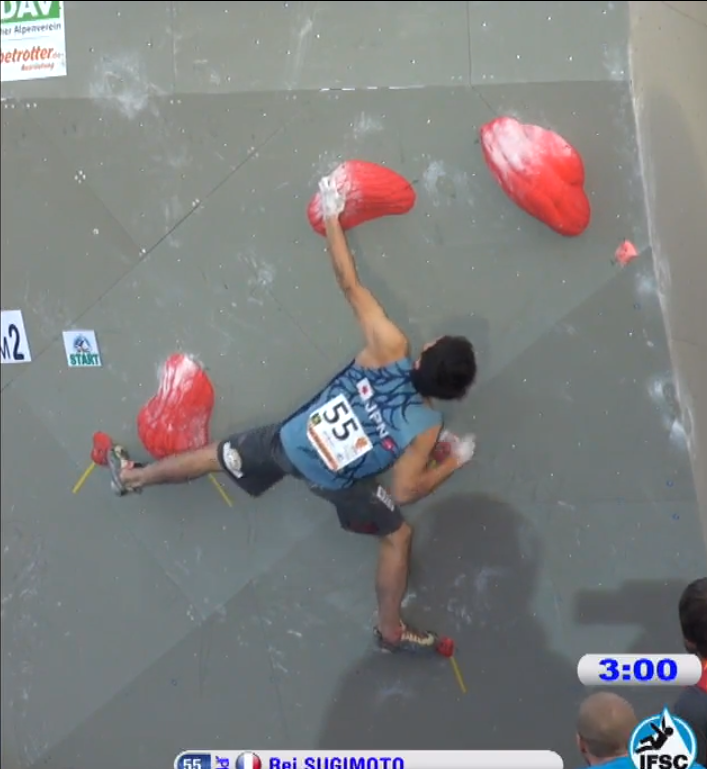 Rei clinging to the volume as he reaches left for the final hold. 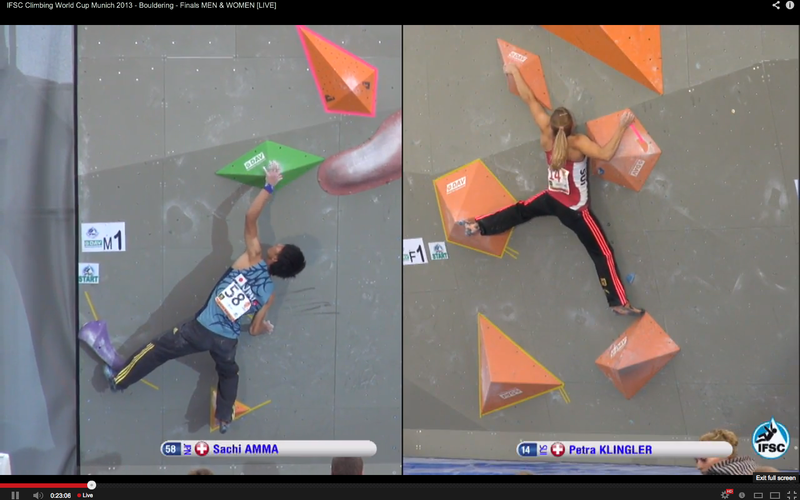 Rei makes the first top in the men’s round. Mykhaylo – no top, bonus? 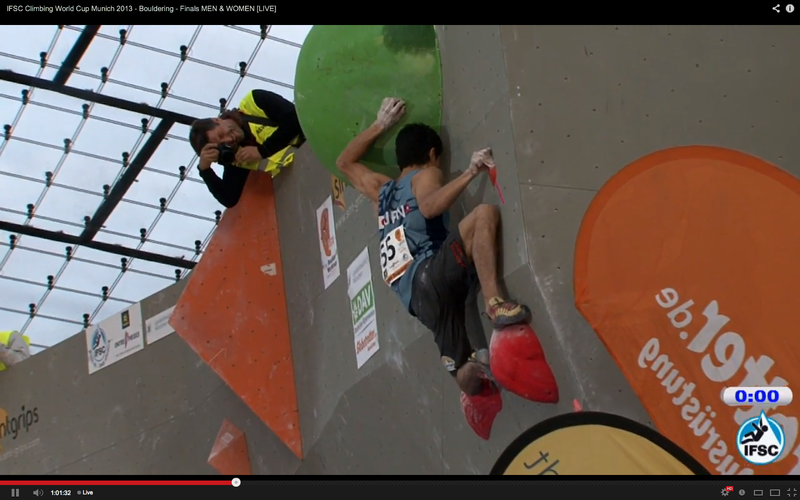 Rustam – looked good, got bonus, fell getting feet up. Falls again, calls to crowd for support, falls again, Heel blows, falls again. 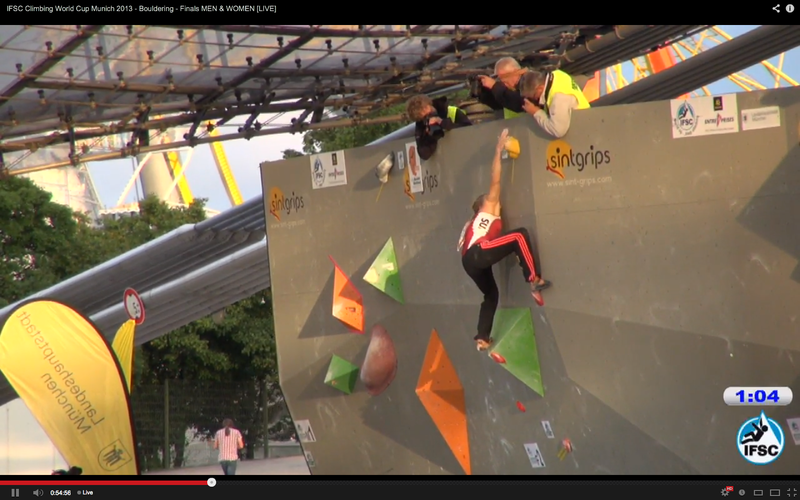 Dmitrii – sends 2nd go and in 1st now. Thomas – sends! Several goes. In 2nd now. Rei is now in 3rd.